Lastest issue of Motortrend just made me sad. On the cover are a 2010 Mustang and a Nissan 370Z. Along with the cars are stats. WTF. How is this NA V6 making more power and killing us in 0-60 so horribly. The 370Z only weighs 200lbs less so its not a huge weight advantage. It gets worse when you actually open the mag. The as-tested prices were real close, $34k for the 370z vs $33.3K for the stang. 1/4 mile in 13.3 @ 105.7 versus the stang's 13.7 @ 103.7, 6-speed versus our 5-speed, better gas mileage also gives the nod to the 370Z. I just feel that ford let us down on this one. I was hoping for more. 350HP NA doesn't seem like asking for to much. Sure the interior is nice, the exterior is growing on me, but the performance just isn't there. those probably aren't realistic prices here! Fords will almost always be available at less than MSRP. The 2010's will drop in price as soon as the first brave souls have theirs. The new Z will have a markup for the first run, but I still don't believe the Z's MSRP will be that low. Most seem to come with the optional packages that jack up the price closer to $40,000. You can't just order a stripped down one and have to go with whatever your dealer has. Many will probably come with the 7spd manumatic, which will jack up the price even further. No prices are even on their website yet. No way. I don't see any CAI/Tune stangs running 0-60 in 4.7sec. Gears would be a must and then gas mileage and drive-ability are given up. That Z is going to be pretty close to maxed out power-wise though, without major modifications (unless something has changed in the past like 2-3 years). I had a 2005 35th Anniversary 350Z. It was a beautiful car, but I got extremely bored with it... it just didn't have any soul, if that makes sense. Functionally, it was pretty flawless, especially in the canyons in Utah where I lived at the time. IMO, the Mustang has always been about starting with a good foundation and modifying the car. Those who wish to buy a "fast" Mustang out of the box can go for the Shelby, Saleen, Roush, etc. But for the majority of us, the fun is in the modding. And the Mustang has always been the underdog. 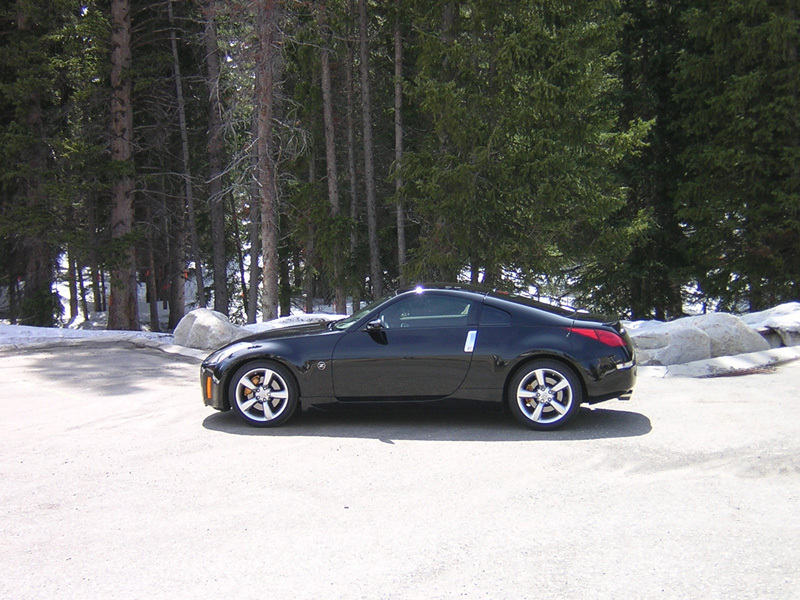 Here is a pic of my old Z, for a stroll down memory lane. That is exactly how the Mustang V6 owners think.....at least the ones who are modding. If we wanted a faster Mustang out of the box, we would have bought a Shelby GT500KR. It's fun to see how fast we can make this cast iron motor turn. You guys think the 370Z is a threat to Mustang GTs.....better take another look at the Nissan GT-R. It's a V6 that packs 480 hp and has 430 lbs of torque! Yes, the price is crazy expensive ($76K-79) but it's a V6 for crying out loud! What kind of hp would Nissan get if they worked on V8s??? Nissan has always been an engineering company mainly, and their engines are proof positive of that. The GT-R is a pretty incredible machine for the money, and the 370 is a nice car too. If you were looking to buy something that would be a blast in the twisties or on track days, and not modify it much, the 370 is a good choice. I really don't miss my 350Z at all though, other than to think back that it was just a really nice, albeit not very exciting car. I'm sure there will be turbo chargers for these car. There always is. They'll do the same things to up power that we do. Sure we have NA mods to get us close to 400hp, but the cost makes is silly to not just go FI. Car magazines are biased. The mustang always loses in everything. ESPECIALLY when faced up against a foreign car, hot **** they have a fiesta bashing American cars. However, Ford definitely let us down with only 315 hp. They do have to keep their sales up though... after we get through this economy, maybe Ford will surprise us... but probably not. I still love my mustang and would never trade it for a 370 and have to listen to the horrible noise it makes everyday. and to 07 stang... the GT-R's V6 only makes that much power because it has twin turbos. Quick Reply: Lastest issue of Motortrend just made me sad.